"Indiana, #1in competitiveness for business investment. 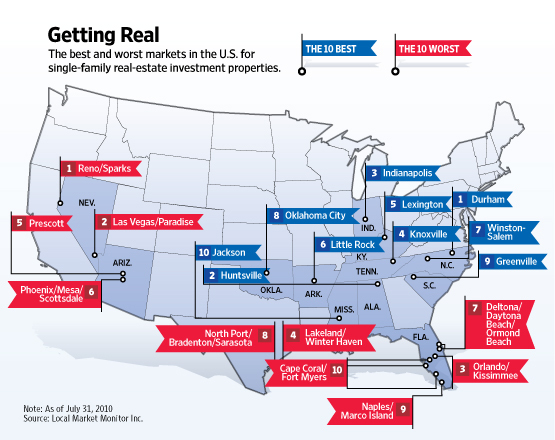 Indianapolis is rated as the premier investment property market in the United States. Unemployment and the cost of living are below the national average. Indianapolis is the center for pharmaceutical and bio-tec companies. This means a very strong local economy. But even with a strong local economy and Indianapolis' growth as a business center - foreclosures are a fact of life. In fact, Indianapolis has the highest foreclosure rate in the country. There is 1 foreclosure for every 69 households. For the investor, this means quality undervalued properties are readily available. There is a strong demand for single-family rental homes created by foreclosures, and 42% of housing units are rentals. API can help you to grab these opportunities for financial rewards- instant equity and cash flow. Indianapolis is the nation's 12th largest city. More than 65 % of the U.S. lives within 700 miles of Indianapolis. It ranks as one of the cleanest and safest cities in the country. Several Forbes 500 companies are located in the city- like Eli Lilly and Company, Anthem Inc, Hunt Construction Group, Duke Realty Corp. It has 7 high-tech business development areas that have been designated as "Certified Technology Parks," supported with state tax incentives. Major employers include American United Life Insurance Co., DowAgroSciences, Roche Diagnostics, Rolls Royce and Clarion Health. The city is served by four interstate highways, six railroads, an international airport and a foreign trade zone. Indianapolis public schools spend $7,078 per student above the national average of $6,058. The world famous Indy 500 supports hundreds of local motor sports companies generating $300 million a year in wages. Indianapolis is home to the Colts, Pacers and AAA Indians. Top 25 Indiana manufacturing companies consistently outperform Dow Jones Industrial Average.